I am so excited and proud to announce a partnership between Katherine LeGrand and JewelStreet! JewelStreet is an international website dedicated to showcasing some of the world’s best independent designers. This is such an honor and has been the perfect match for both brands and our customers. We are happy to share you can now shop for Katherine LeGrand on JewelStreet! The pieces for the JewelStreet collection have been handpicked with the intention of representing all of my design aesthetics for the world to see. Katherine LeGrand designs are practical and glamorous and I believe my jewelry truly reflects that. While sometimes I focus on clean lines and simple presentations of the gems, I also understand the need for some whimsy and creativity to break through and shine. Regardless of the piece, each one is representative of my art story, passion and care for detail. These dainty, stunning studs are inspired by recurring patterns in the Mediterranean and Middle Eastern ancient wood screens. 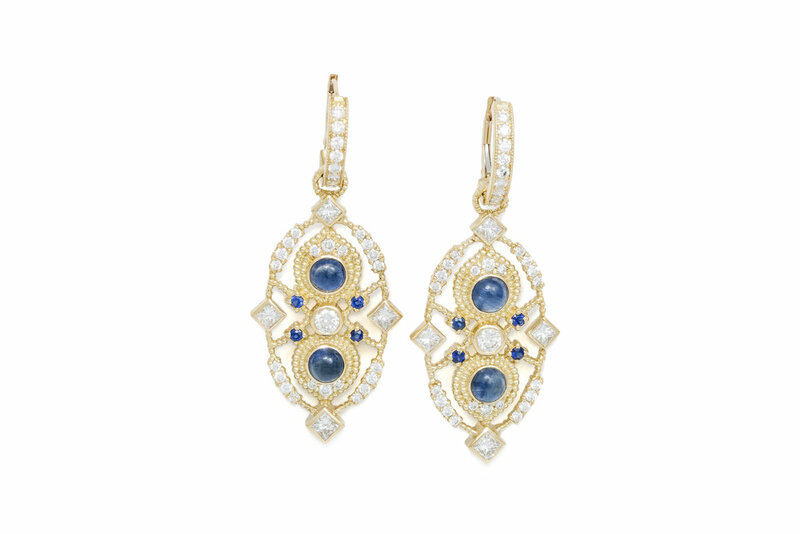 Perfect for both daily wear or a special evening out, consider these the LBD of earrings. Shop the piece. You know this is a good piece when I personally have it in my jewelry collection. The enchanting mood in this ring is created with blackened sterling silver mixed with the dark beauty of Amethyst. Gorgeous with everything from an evening gown to a pair of workout pants. Shop the piece. This pendant screams old world charm. From the deep blue Tanzanite to the diamond details, this will immediately be the star of the show. This truly needs to be seen to be appreciated. Shop the piece. Perfect for the world traveler. This is a fanciful play on Moorish and Middle Eastern historic designs. These are designed to go on the Petite diamond hoops, so they can be switched out for a quick look change. Perfect for travel! Shop the piece. This extremely rare gem does all the heavy lifting with incredible purplish-red hues. It is uniquely cradled by broad black diamond paisleys and white diamond bubbles. Shop the piece. These products are only a small example of the amazing pieces I have to offer. These unique pieces make the perfect gift for the holiday season, for a loved one, or even for yourself. You can’t go wrong with these elegant, timeless gems. Check out the entire Katherine LeGrand collection on JewelStreet here and give me a follow on Instagram. In honor of my new launch with JewelStreet, I am so excited to release a brand new design and give everyone a chance to win it with a contest giveaway! Head over to my JewelStreet boutique between Friday, November 10th - Friday November 17th. Post your favorite piece to Instagram and Pinterest. You MUST include the hashtag #klegrandjewelstreet AND follow @slvrqueen on Instagram. Make sure you pay attention to the requirements and details below! Once we see your post, consider your entry received and wait to hear if you’ve won! You MUST include the hashtag #klegrandjewelstreet AND follow @slvrqueen on Instagram. Only one entry per person will count, but feel free to post as many of your favorites as you want. You have one week to post: between 11/10/17 - 11/17/17 and the winner will be chosen and reached out to the following week. The winner will be able to choose their metal color of choice for the piece. More information about the contest piece coming soon!